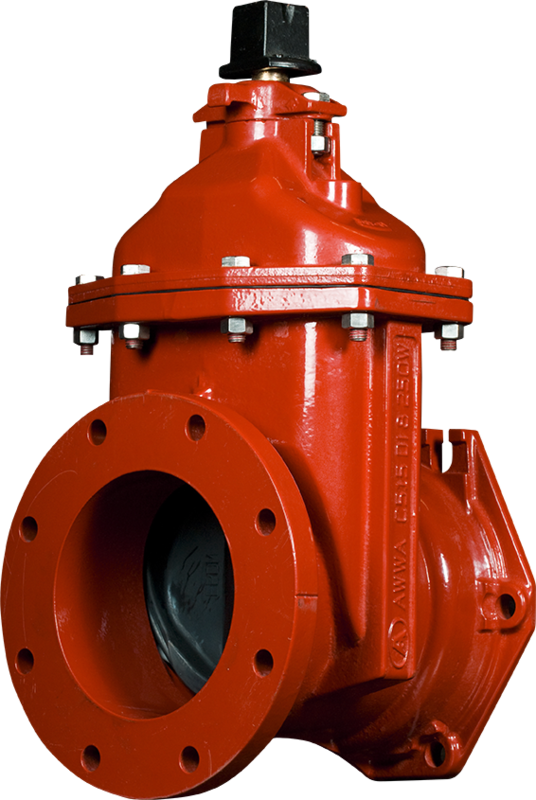 The AMERICAN Series 2500 Ductile Iron 250 psig AWWA Resilient Wedge Gate Valve is designed for use in drinking water, sewage and fire protection systems as well as irrigation and backflow control systems. The Series 2500 Resilient Wedge Gate Valve is furnished in configurations that are UL Listed and FM Approved. Sealing the lubrication chamber is a series of three O-ring stem seals. The O-rings help to isolate the lubrication chamber. Two thrust washers are used: One is located above and one below the thrust collar. The thrust washers help provide easy operation by minimizing operating torque. The ductile iron body, bonnet and wedge provide strength and a pressure rating that meets or exceeds the requirements of AWWA C515. The tensile strength of ductile iron is more than twice that of cast iron. This added strength makes the Series 2500 more durable and rated at 250 psig. This strength and higher pressure rating is provided in a compact, lightweight and easy-to-handle ductile iron valve. The Series 2500 valve is epoxy coated on the interior and the exterior. The fusion-bonded epoxy coating is applied prior to assembly. The bolt holes and body-to-bonnet flange surfaces are fully epoxy coated. The body-to-bonnet and stuffing box cover seals are pressure-energized O-rings. This reduces the need for excessive bolt loading, which is required by designs that use flat gaskets. The O-rings are reusable, which reduces downtime during any needed repair.